Older entrepreneurs differ from their younger brethren in several critical ways. For one, seniors are usually in a much better financial position than younger entrepreneurs. Their bigger financial cushion — retirement packages, nest eggs, or home ownership — affords them flexibility in the initial stages of a start-up, where funding is often critical. Because they can often rely on other sources for current income, they are in a better position to take greater entrepreneurial risks. Start-up funding may also be easier to come by for seniors, who can draw from personal savings and a lifetime of business and professional contacts. Senior start-ups may also be looked on more favorably by lenders, who often associate older entrepreneurs with a lower risk of default. Creativity and business acumen are also key characteristics of elder entrepreneurs. Older entrepreneurs bring “an invaluable network of contacts, credibility, and investment acumen,” says Barry Merkin, a professor at Northwestern University’s Kellogg School of Management. Having been tested again and again in their lives, they’re not afraid of failure or worried about what others will think. Instead of that urgency to “make it,” they get their satisfaction from the process of building their companies. The type of businesses typically started by seniors varies widely. Consultancies, small retail businesses, and bed-and-breakfast establishments are perennial favorites. A growing number of late-life start-ups also involve Internet-based businesses which, even after the dot-com bust, remain a popular type of new business start-up. For many, Web-based business start-ups offer particular appeal, since they can be operated right out of your home in the early stages, often requiring no more than a high-speed Internet connection and a phone line. While most senior start-ups are related to an individual’s former career, some break into completely new territory. This is often the case with “serial” entrepreneurs — those who have started up many different businesses over their lives and are experts at the start-up process itself. Whatever business you might consider, make sure you first do your homework. Talk to owners of similar businesses and scope out the market for such products or services in your area. Then, take the time to draft a formal business plan. As attractive as starting a new business in retirement may sound, there are several considerations you should bear in mind before taking the leap. Start-ups can be physically and emotionally draining for a retiree. Seniors tend to work fewer hours and take more vacations than their younger counterparts. Ask yourself: Are you willing or able to work the long hours that may be required in a fledgling business? There is also the matter of elder health concerns. For seniors, health problems can come at any time. Even if you are in top shape, you should factor in contingencies for unexpected health issues for yourself and your spouse. Then there’s financial vulnerability. “Failing at 60 is not like failing at 30, when you have lots of time to build up your assets,” says Martin Nissenbaum, national director of retirement planning for Ernst & Young International. Seniors also rely much more on personal investments to supply a portion of their income. For these reasons, seniors are advised not to sink too great a portion of their investment portfolio into a new business and should avoid pledging as loan collateral personal assets such as a home. Build on already established contacts and expertise. Seniors have a distinct advantage over younger entrepreneurs in their experience and long-established business network, which can give them a competitive advantage in virtually any business. Start small. When starting up a new business in retirement, many begin with a small consultancy and gradually work their way into a full-blown business. This will give you time to assess whether you’re willing or able to take on another full-time career. Don’t bet the farm. 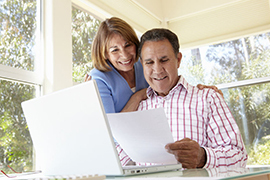 If you’re retired, you probably rely on personal investments for a portion of your income. Consider your income needs before investing a portion of your nest egg in a new business and think twice before taking on any personal debt. Some practical businesses that are popular among retirees. Today, with lengthening life expectancies and dwindling pensions, an increasing number of retirees are looking to retirement as an opportunity to start a new business. Older entrepreneurs differ from their younger brethren in several critical ways: They are usually in a much better financial position; they generally have easier access to funding; and they are able to tap into a lifetime of experience and connections. The type of businesses typically started by seniors varies widely. Consultancies, small retail businesses, and bed-and-breakfast establishments are perennial favorites. Before considering a senior start-up, you should weigh the physical and emotional pressures that a new business is likely to place on your life, and remember to factor in the heightened health considerations of elders. Seniors are advised not to sink too great a portion of their investment portfolio into a new business and should avoid pledging as loan collateral personal assets such as a home. Because of the possibility of human or mechanical error by Wealth Management Systems Inc. or its sources, neither Wealth Management Systems Inc. nor its sources guarantees the accuracy, adequacy, completeness or availability of any information and is not responsible for any errors or omissions or for the results obtained from the use of such information. In no event shall Wealth Management Systems Inc. be liable for any indirect, special or consequential damages in connection with subscriber’s or others’ use of the content. © 2016 Wealth Management Systems Inc. All rights reserved. Envisioning Retirement – OMG, What if You Live to Age 100 (or Older! )?